Red Clay from the Gold Mines of Sado Island. Anyone has any experience with this clay? Seems to be highly sought after and is down to a very limited stock due to the closure of the mine to make way for an airport. Any sharing is well appreciated. Some reading I picked up from Hojo’s website. I enjoy using my two Shimizu Ken Nosaka pots with sencha and also lighter high mountain oolong like LiShan, DaYuLing and FuShouShan. One is with Namamigaki, the other without. Aesthetically I prefer the more textural surface without Namamigaki. 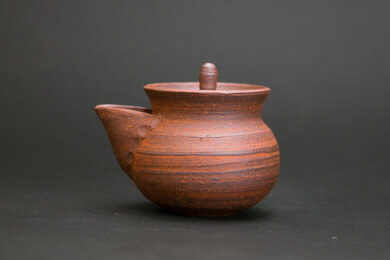 I would agree with Hojo, there is a big similarity between this clay and Hongni which I use for lighter high mountain as well. The Shimizu Ken pots have slightly thicker walls than my shudei Tokoname pots, so retain heat nicely for high mountain oolong. I would say Nosaka and Hongni pots hold aroma, body and flavor of these teas well, bringing smooth sweet aspects to the forefront. I’m currently seasoning and prepping my Nosaka by Watanabe Tozo using ZhangPing ShuiXian.. so far the affinity between Nosaka clay and ZhangPing is pretty good. Very similar results to my ROC QingHuiDuan who brews an excellent cup of ZhangPing ShuiXian. Victoria, your observations are spot on regarding Nosaka clay. I wonder if there is a difference in the clay used by S.Ken and W.Tozo. 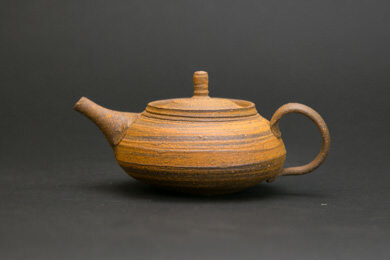 Can't comment on Watanabe Tozo nosaka pot comparison, but it looks very similar to Shimizu Ken's nosaka. Here is a side by side with Emu's thinner shudei pot. Very different pots. This baby just arrived... gonna get it prepped for testing and comparison. is that pot by watanabe tozo? the lid doesn't look like his style, but everything else does. I wonder if there is a difference in the clay used by S.Ken and W.Tozo. these guys collected their clays from their own spots and also processed them themselves. their clays are different in appearance and feel. performance is similar but probably not identical. even clays with the same names are not the same (shimizu's mumyoi clay is different than watanabe's akitsu mumyoi). In what way would the lid appear to be different in Tozo’s usual style? the lid's flatness and moreso its overhang. imo not his usual style. looks cool. i have not been following hojo's offerings as much lately, but looking now, it's clear to me that tozo's style is evolving a bit and that he's experimenting. looks like he's playing around with yohen a bit more and is using different colors of clay (mixed) and maybe aggregate. The pot I just received is bought off the hands of a collector and have been in his possession for over a decade. 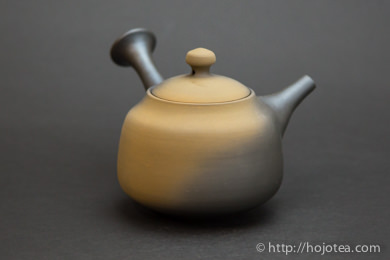 This is among the first batch of Mumyoi teapots made by Watanabe Tozo for Hojo. Interesting to note the evolution of his workmanship and design. Update on Tea Pairing with Mumyoi by Tozo from Sado Island..
I’ve since tried the pot with a host of teas young and aged. The best pairing is still pointed towards fresh greens like LongJing and raw Puerh, both raw and aged. Also had an interesting round with a 20+ yearold ripe puerh. 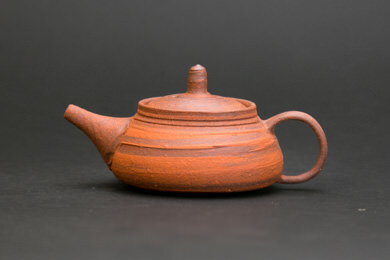 The clay elevates the aroma, fragrance and aftertaste of tea in general. Sounds like it might be a good match for Gaoshan as well? Did a comparison with GaiWan as control and another 80s teapot known to have good results with green fresh TieGuanYin. The closest I have to GaoShan is my fresh TGY. The Mumyoi is not as good as the 80s green clay. But it did smoothen the tea broth and heighten the aroma. Unfortunately the after taste doesn’t linger on in the throat as long as the GaiWan or 80s Green Clay . Personally I still enjoy the Mumyoi best with aged raw puerh. Beautiful pots! That green clay looks intriguing. Pls feel free to share your findings and pairings of your Mumyoi and Nosaka pots here.